The king of pop is dead. 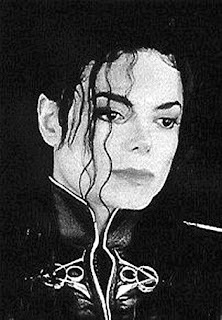 Long live the king...There cannot be a person left unaware of the death of Michael Jackson in recent days. As someone never moved by his music, I have been left a little bemused by the outpourings from the media about the man, his life, his music and his legacy. The thing that has struck me has been the way that the press have not been circling looking for prey in this story so far. Instead, aside from the ongoing pictorial and musical tributes, we are left looking at 50 years of a very private individual, living in the limelight, and yet not knowing very much about this apparently very troubled man. A man who apparently longed for a childhood, a ‘normal’ relationship with anyone, and healing from things that clearly caused him enough emotional pain to seek relief in the form of prescription medication. The media, life in public, more money than you can shake a stick at did not seem to provide the hope, stability, love and healing that he and indeed all of us crave for deep down. This morning, the encounters Jesus has with two groups of people go right to the heart our deepest longings. Jesus crosses the lake with his disciples and they encounter a great crowd. Jairus comes by, he sees Jesus, falls at his feet and begs repeatedly for Jesus to come and heal his daughter. Now just hold the action there a second - it is all too easy to miss the scandal of what is going on here. All too often it is the leadership of the synagogues and their priests that give Jesus a hard time, and yet here, Jairus part of that leadership comes to Jesus. He is clearly a desperate man - so desperate that he will reach out across religious boundaries seeking healing that he has been unable to obtain through other channels for his daughter. Jairus came to Jesus as an equal - as a man. This woman approaches knowing that according to the religious and social rules of her day she could not even speak let alone touch another man. Jairus was first, this woman was most definately last. The woman who touches Jesus has been bleeding for twelve years. Jairus’ daughter is twelve years of age. Although this is inserted in brackets in the text, it is no afterthought, but an absolutely deliberate dramatic irony. Here are two women – one whose life as a woman has apparently finished, and another whose life as a women is just starting. The woman has been bleeding for the lifetime of Jairus’ daughter. All the time the girl has been growing, the woman has had her life ebbing away. Two lives that should never meet. The woman is one of “the crowd” – one of the poor and socially outcast. She is doubly ostracised because of her menstrual bleeding. She has become one of the “untouchables”. Jairus’ daughter, by contrast, comes from wealth and privilege. Yet they are destined to meet in Jesus. Here is a sign of the new community: the barriers between rich and poor, between those at the social centre and those on the periphery, are removed in Christ. Ironically, the woman is restored to life at the very moment at which the girl dies. Do you see how socially loaded this story is? For one woman, the social ostracism of the past twelve years is ending; for the other, the wealth, privilege of the past twelve years is also ending. Two powerful stories. But take another look at the small details of the stories as they have as much to teach us as the main events themselves. In both cases there was a crowd - people clearly expected Jesus to demonstrate the power of God in word or action. In both cases, both Jairus and the woman had an urgency about them, they know that Jesus could do want they wanted, needed, longed for. In both cases, touch was seen as central to the act of healing - lay your hand on her - touch the hem or edge of his robe - there is something quite physical going on here. One thing we could learn fro this story is that healing is to be expected with the power of God at work in Jesus. We should expect it, even if it doesn’t seem to work out the way that we thought or hoped. The danger is we live in an instant world and expect instant results and when one desperate prayer is not answered we shake our fist at God and walk off. And yet physical healing falls into place as a small piece of God’s healing plan for Jairus, this woman, Michael Jackson and us. In these two encounters, Jesus begins to heal the social and religious rifts of his day and offers healing through the creation of a new social order where no one dies and no one is excluded. Here is a sign of the new community: the barriers between rich and poor, between those at the social centre and those on the periphery, are removed in Christ. And if you think that sounds pie in the sky, look at what Jesus says to the haemoraging woman - your faith has made you well, go in peace and be healed of your disease. A really strange way of saying - be healed but there is something more to what Jesus offerers that woman, Jairus and his daughter, Michael Jackson and you and me. Jesus assures that woman that it is her faith that has healed her from her disease. There is another whole sermon on what that might mean, it is the words - go in peace that sit staring us in the face this morning. Peace - shalom - is the presence of the good ness of God, of wholeness, completedness. To go in peace is to have the blessing of God on all of her, not just her physical body - but God’s presence on and in her whole being. Peace and salvation - restoration with God and living in harmony with him and each other. What did Jairus and the woman really want from Jesus? What did Michael Jackson crave? And us, what do we really want? Quick fix answers from an instant god in an instant world?